The "Mushroom Lady" of Alberta, author and illustrator of the go-to mushroom field guild for north-west North America. Helene Her interest in mushrooms began when she took up painting in the early 1970s. 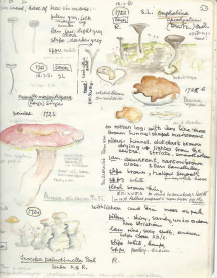 'Leni' sketched thousands of varied species of mushrooms in their native locations. Her dedication to mycology led her to become a expert in the field, recognized across North America. 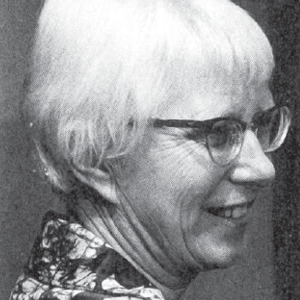 She was called on and consulted to identify fungi discoveries, and she taught courses in field identification in Edmonton for 10 years. 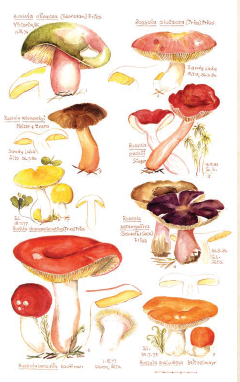 identification bible for many amateur and emerging mycologists. 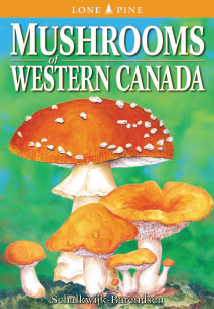 This was widened and republished as Mushrooms of Northwest North America (1994). "When I spotted a mushroom new to me, I sat down and painted it in its own environment, always life size." 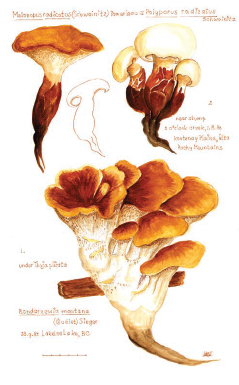 "I collected mushrooms in different stages of development, and used them back at home to record further details in my sketchbook, and to prepare dried specimens to send to academic contacts who used them in their research." Quote: Preface, Mushrooms of Western Canada. Lone Pine Press. 1994.